Search any kitchen, and you’re bound to find a few common and familiar things. Whether it be utensils, glasses, cups or pots and pans, what we use today to cook food, serve and eat is mostly uniformly recognizable. It hasn’t always been that way. Our cookware has come a long way from its primitive forms from thousands of years ago. While it has changed over time, the way we use it remains the same. Most likely, the pots and pans found in the average kitchen are mismatched and well-worn. That’s because for most people, cookware is a secondary thought. Over time, their kitchens and cookware are a collected combination of new, old, well-used and handed-down items — replaced only when they’re no longer useful. However, just like major appliances, such as a stove or refrigerator, proper cookware is an essential part of a well-functioning kitchen. Just ask anyone who spends a significant amount of time in the kitchen preparing delicious meals. It doesn’t matter if it’s a seasoned chef or a family cook, if asked they will be able to tell you what their favorite tools are, as well as the cookware they couldn’t live without. That’s because the wrong type of cookware can burn food, alter the taste or even make it toxic to eat, and knowing the difference is key. For the budding chef or seasoned veteran, it’s important to know which type of cookware is safe to use and why. Below, we will discuss the history of cookware and explore the different types used throughout time to understand why they’re still used today. Most importantly, we will review why Xtrema 100% ceramic cookware is the best choice for your kitchen today. Manmade pottery has been around for thousands of years, as far back as 24,000 B.C. Before this time, humankind had to rely on foraged shells, sticks and naturally occurring clay to make tools to prepare meals. Often, animal parts were used to store and carry food. With the discovery and control of fire, people realized they could create pottery to carry water and cook food. This completely changed the way we ate. Pottery and ceramics have been the perfect materials for our cookware since the beginning of creation, but had a little flaw: The first ceramics were difficult to produce on a large scale, and were very fragile. As society and humanity grew across the world, we discovered new materials to make our cookware with, including cast iron, copper, aluminum, and most recently, Teflon. But ceramics never went away. Even today as technology has allowed us to develop innovative forms of cookware, ceramic cookware is still around — in fact, it’s stronger than ever. In comparison with other materials, it’s easy to see why. Cast iron itself has been around almost as long as pottery. Dating as far back as 513 B.C., in China, cast iron was used for weapons, figurines and cookware. It was around the 12th century that Europe recognized cast iron cookware, but at first, it was only available to the rich. Between the 15th and 18th centuries, the most popular form of cast iron cookware was the three-legged cauldron. Soon enough, the cauldron became the heart of the kitchen. It allowed cooks to make slow-cooking soups, stews and sauces. It was such a symbol of the changing times that the cauldron became a symbol of old English iconography. Today, cast iron cookware is often used in skillet form. It’s multi-purposed and can go from stovetop to the oven, as it has great heat conductivity and heat retention. For the un-informed chef, it’s necessary to note that cast iron cookware does have its drawbacks compared to ceramics. For starters, cast iron requires upkeep through a process called “seasoning.” To season a cast iron skillet, the skillet is subjected to high-heat conditions (at about 300 degrees Fahrenheit) and layered with oils to give it its natural non-stick surface. If not seasoned properly, cast iron can also rust or flake. Most cooks recommend not using soap with cast iron skillets to keep the seasoning in place. Instead, you should clean it with a damp sponge or paper towel. To use it properly, cooks and chefs have to put the piece through the seasoning process. Cast iron is brittle and is prone to flaking and rusting. It is also very heavy, and often has a core made up of another metal to keep it from breaking. You cannot use certain utensils on cast iron, as they may scrape or damage the surface. Cast iron also requires other materials to handle it safely, like potholders or sleeves, as it is often too hot to handle on its own. During the manufacturing process, cast iron creates a lot of pollution, which can be harmful for factory workers. While the manufacturing of ceramic cookware is very green, the creation process of cast iron cookware can be harmful to the environment. Cast iron cookware is not recommended for those who suffer from high iron, as iron from the piece will leak into the food. Although it is safe for those without any issues with iron, keep in mind that the oil used to season the cookware and the natural iron will alter the taste of your dishes. Copper cookware has been around as far back as 9,000 B.C. in the Middle East. It did not become widely available until the 19th century, after inventors found that copper was a great insulator and conductor of heat. It’s difficult to talk about copper cookware without pointing out its drawbacks, however. Compared to ceramic cookware, copper and other metals can be downright dangerous. Metals can’t be placed in the microwave like ceramic, and although copper has some antibacterial properties, and it is part of the human body, the consumption of copper in large quantities can be toxic and fatal. In the 18th and 19th centuries, copper cookware was commonly lined with tin to prevent poisoning, and specialists in the trade could reline the tin when it became chipped. Though proper maintenance can keep the tin lining from wearing prematurely, relining it is still recommended to keep the copper from tainting foods or altering the taste so it becomes metallic on the tongue. Although some swear by glazed cookware — even ceramic glazed cookware to avoid toxicity but still enjoy the conducive properties of copper — glazes can weather and erode over time, and will no longer protect foods over long-term use. The same can be said for bronze and aluminum cookware. Bronze is often made with copper and lead. Both metals can linger in the human body and become poisonous in high quantities. Aluminum also has a link with triggering Alzheimer’s disease in humans, so it is not recommended for use. Of all the metal, stainless steel is the safest alternative, although with some flaws as well. Stainless steel is great for quick dishes, including sauces and sautés. However, stainless steel is not a great conductor of heat, and it heats unevenly. Foods cooked in stainless steel are prone to sticking and burning. You should add oil or let it heat first before cooking. While stainless steel is safer than the other metals, it is not conducive to great cooking. Today, it is difficult to shop for cookware without learning about Teflon. For decades, Teflon dominated the cookware market, and it seemed to be the answer for all of our cooking needs. But Teflon, a man-made material, is highly toxic and a possible carcinogen, making it one of our century’s most deceptive and disappointing discoveries. Teflon is famously known for being discovered purely by accident. In April 1938, DuPont chemist Dr. Roy J. Plunkett was tasked with developing a non-toxic alternative to refrigeration gasses such as sulfur dioxide and ammonia. Plunkett created a gas named tetrafluoroethylene (TFE), and then refrigerated it. What came out later was not a gas, but instead polytetrafluoroethylene (PTFE), a white slippery substance. After some tests, Plunkett found that this new substance was non-corrosive and stable, with a high melting point. It was also incredibly slippery. Soon enough, Teflon was everywhere. Within three years, it was patented and trademarked. By the 1960s, Teflon was used as a stain repellant and insulator, but most importantly and most popularly, cookware. For a long time, cookware was considered subpar without a Teflon coating. Shoppers sought it out and mothers swore by it. It hasn’t been until recent years that we’ve realized that Teflon has adverse effects on the human body and is by no means a safe alternative to ceramic cookware. For starters, Teflon coatings on cookware can wear off over time. Chippings can even mix with food, so we ingest both food and toxin. Teflon can also create toxic fumes at high temperatures, and these fumes are poisonous for both humans and pets. Until 2005, the manufacturing process for Teflon included the use of a chemical called PFOA, or C-8, a chemical that can cause liver damage, cancer, compromise the immune system and lead to death. Although PFOA was only used during the manufacturing process, it was found in high levels in the environment. The EPA has since reached an agreement with major Teflon manufacturers to stop the use of PFOA, but there is no guarantee that other countries are following the same guidelines. Needless to say, Teflon is highly discouraged and deemed unsafe. The major downside with pottery was that it was fragile, and so it fell out of fashion. Alternatives left cooks and chefs with options that may have been less likely to break, yet had many more downsides. 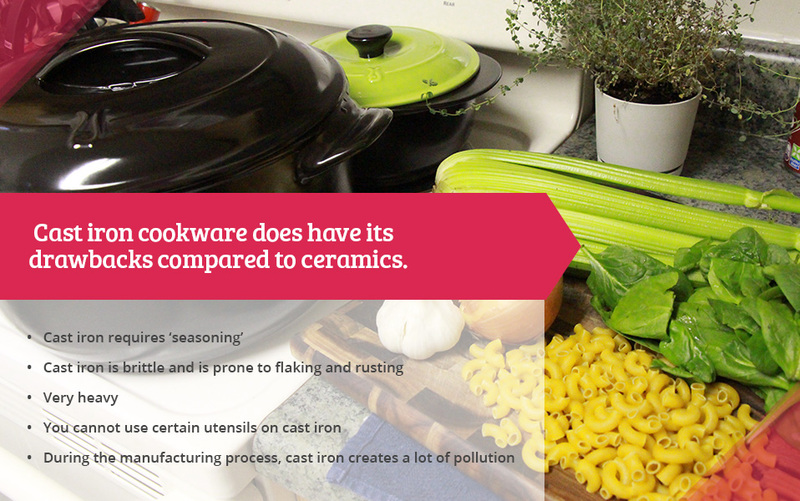 It seems as if ceramic cookware is still the best option we’ve had when it comes to clean, green cooking. Today, developments in manufacturing and technology have allowed us to reconsider pottery for cookware, repurposing the same materials and molding them with upgraded and technologically advanced techniques. Ceramic cookware, the more modern cousin of pottery, has all the advantages of its predecessors without the drawbacks. It is 100% green and environmentally friendly, both for users and workers. Xtrema 100% ceramic cookware is now the new alternative to metal cookware without the risk of metal leaching toxicity. You won’t have to season or prep a ceramic skillet, as maintenance is simple. Xtrema is low-maintenance and versatile, and it can easily go from the stovetop to the oven. Xtrema can also go into the microwave without risk to your safety. You can use it to grill, barbecue and refrigerate foods. The Xtrema glaze is fired at 2500 degree Fahrenheit, creating a solid, scratch-resistant and non-toxic surface that won’t flake off and mix with your food. The reviews are in, and the answer is clear. Xtrema is lighter than cast iron and can be handed down for generations. Infrared technology has also shown that Xtrema cookware allows heat to penetrate foods, cooking from the inside as well as the outside, unlike metal cookware that will only cook from the outside. It is also bacteria resistant, so foods will not stain into the ceramic or be absorbed into other foods. The result is fresh, clean cooking every single time. Simply put, the reviews make ceramic cookware the cookware of choice. If you want the best that history and technology have to offer, you want 100% ceramic cookware. But don’t just take our word for it. Invest in your first Xtrema piece and review it for yourself. Whether it’s a skillet, a sauce pot or your very own roasting rack, take the first step to discover what great things you can cook with Xtrema cookware.